(Newser) – These days there are plenty of options for those who want to test their (or a friend's) blood alcohol content before getting behind the wheel, but a finger prick is the best bet if what you're after is accuracy. 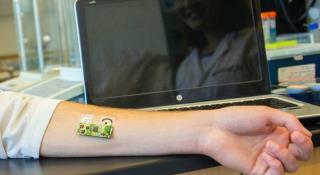 Now researchers at the University of California San Diego are reporting in the journal ACS Sensors that they've developed a temporary electronic tattoo that can induce just enough sweat to get a highly accurate read—which would be sent to a smartphone with an easy-to-interpret app—in minutes. "Such a device hasn't been available until now," engineering professor Patrick Mercier says. I can tell when I am drunk; I fall off the bar stool..
Now all we need is one for cops that tests for steroids. I LOVE IT. Once had a friend arrested for drunken driving. Turns out he had medical problems which made his body not metabolize the alcohol at the rate it usually does. If he had this device, he would have known he was over the limit.